The time for moon gazing, lanterns and indulging in mooncakes is soon upon us. Falling on 24th September this year, we will yet again be sending and sharing delicious morsels of sweet cake with one another in the time-honoured tradition of Mid-Autumn. With so many mooncakes vying for your attention, be it classic, creative or even chocolate, we’ve whittled down the choices to a list of the top five boxes to try this season. This mid-autumn, Cantonese fine-dining restaurant Dynasty Garden are bringing both classic and contemporary flavours to the table. Presented in an auspiciously red and gold box; six pieces featuring two large and four smaller mooncakes are included. On the traditional side, white and golden lotus paste mooncakes with double helpings of salted egg yolks are made for sharing, while two creamy egg custard and two with a healthier filling of mixed nuts; packed with peanuts, almonds, walnuts, sesame and melon seeds are offered in mini portions. The Deluxe Mooncake Gift Box, priced at HK$368, can be ordered in venue or online here. For those that have grown bored of traditional style Chinese mooncakes, French pâtisserie Paul Lafayet have restored some excitement with a selection of four French-inspired mooncakes in their Autumn Rendezvous Gift Box. Adapting a french tartelette recipe to create a more continental style of mooncake, four different flavours including matcha, rose & lychee, almond & poppy and our favourite, hazelnut & chocolate. Filled with a luscious centre in a light pastry, the mooncakes is then coated with more chocolate and crispy feuiletine. The HK$320 gift box is available to purchase across all nine Paul Lafayet outlets in Hong Kong. Where there is cake, there is (or at least should be) tea. 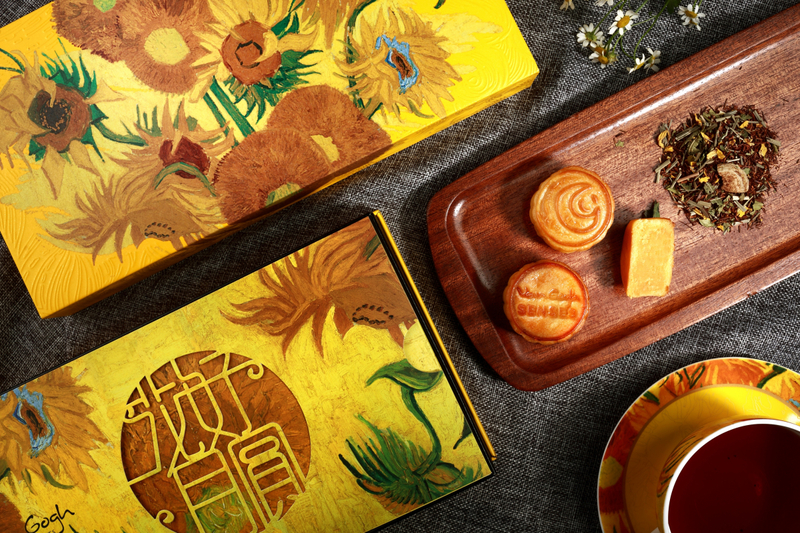 Such is the case of Van Gogh Senses Full Moon Mooncake Set; a collection of six egg custard mooncakes paired with caffeine-free teas including “Sunflower Bouquet”, a lemongrass, chamomile, rooibos and orange peel blend, and “Blueberry Kiss”, which combines rooibos and cornflower with blueberry. The iconic “Sunflowers” artwork of Dutch painter Vincent Van Gogh is also reflected on the box tin, making it the most collectable by far. The six-piece gift box priced at HK$428 can be ordered from the flagship store in 1881 Heritage, Tsim Sha Tsui as well as the newly opened gift shop in Tai Kwun, alternatively it can be ordered online here. We were delighted when Sushi Tsubomi, one of Hong Kong’s best omakase restaurants, decided to launch mooncakes this year and have done so in partnership with wagashi specialist Wakou from Kyoto. Wagashi — a traditional sweet Japanese confection usually paired with green tea — is the style of mooncake which is offered in two flavours; milk with white bean and matcha green tea. We sampled matcha which balances a slightly bitter and sweet fragrant flavour in a soft yet chewy dough. The gift box, inspired by a Japanese zen garden, contains five pieces at HK$268 and is available to order in the restaurant. In collaboration with local finger-painter artist Justin Y, Tycoon Tann are offering a limited edition mooncake gift box which doubles up as an LED-light lantern. Adorned with his new art work titled “Fiesta”, the box itself contains six decadent egg custard mooncakes. The modern Chinese restaurant will also be holding an art exhibition during the festivities from now until 30 September; displaying Justin’s work across the dining rooms with his aptly named collection “Moon Over Paradise”. The gift box/lantern is priced at HK$368 and available to purchase at Tycoon Tann and Mod Bar or ordered with the online form here.